prove all things; hold fast that which is good…And the very God of peace sanctify you wholly; and I pray God your whole spirit and soul and body be preserved blameless unto the coming of our Lord Jesus Christ. Cheerful , and jOY! that is what inspires me to make what I make in my shop! I lived most of my life without Joy in my heart – and I looked everywhere for it. I found it in God, and the way to GOd is through the Lord Jesus Christ. Each item, just about, in my shop features a component purchased from another artisan/seller on etsy, which I have used in my own item. I like to do that – I like to help others by purchasing from them, using their “supply” and making something Cheerful and Joyous! Or, just purchasing from them to support their shop! The more I give, I always receives three-fold back! This item features a “Rudu Bear”. http://www.Rudulatvia.etsy.com is an artist, fashion designer, student ,mom, wife and seller! Yes – Latvian women CAN do everything! 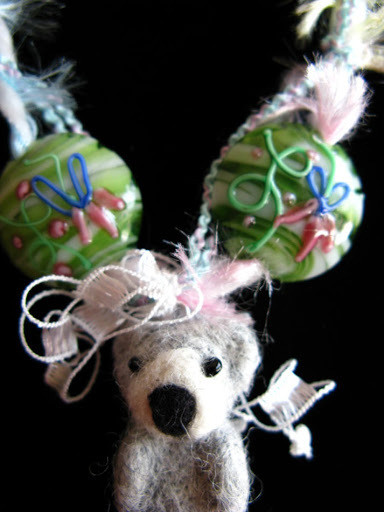 I saw her bears and I asked her to custom make me some so I could use them in necklaces in my shop -I really, really like these bears! They are needle felted, 100% wool, with little bead eyes… they are just the right size to hold in your hand, or a child’s hand…and the texture is welcoming and, well, cheerful! I also think it is so neat that I can have a friend (actually I have 2!) who live in Latvia, while I am here in California! Thanks be to God! The internet and etsy.com have put me in touch with kind folks that have enriched my life greatly. (my other friend in Latvia is http://www.FiligreePhotos.etsy.com / http://www.FiligreeCreations.etsy.com )OH! I would also like to add that the beautiful fibres with which I made this necklaces are from one of my friends in the UK, http://www.cardsandcraft.etsy.com ! Isn’t God amazing? SO, there you have it! A one of a kind, international, cute necklace! Thank you for stopping by!~Send me a convo if you have a question or if I can make you anything and I will do my best!